The advertisement-supported program PortalMore has been created by SuperWeb LLC. Unfortunately, this suspicious browser extension is just as unreliable as other plugins within the family. Whether you are dealing with Skywebber, the clandestine PodoWeb, or the suspicious SunriseBrowse, you should be equally as worried about the removal of any of these programs. If you are not sure you can remove PortalMore from the Windows operating system successfully, we recommend reading the report. 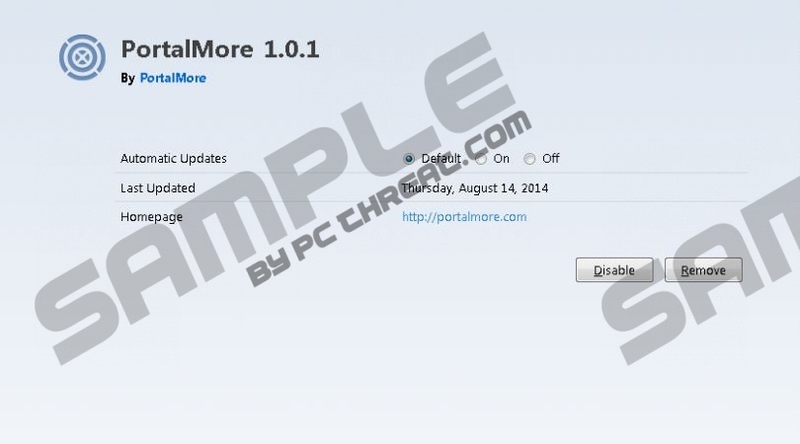 If you are on the verge of installing PortalMore onto the computer, we recommend that you reject the idea altogether. If you want to use software which will produce authentic saving deals, this is not the extension you are after. The program advertised at portalmore.com is nothing but an advertisement-supported program which presents offers which have nothing to do with virtual benefits. If you install this adware, you will need to worry about its removal. So, if you are not excited about having suspicious software deleted from the operating system, you should not install it in the first place. On the other hand, if PortalMore has been installed already, you have to handle the situation with appropriate caution. The first thing you should determine is what other unreliable software has been infiltrated on the PC. PortalMore and other SuperWeb programs are spread using fake java\flash\player updates, and these installers often carry other adware, PUPs, tracking cookies, and even malware. Some of these programs may be more dangerous, and you may need to delete them first. If you have no experience with the detection and removal of malware, the first thing to do is install a malware scanner. ‘PortalMore Ads’ or advertisements ‘Powered by PortalMore’ can promote suspicious installers. If you discover flashy advertisements suggesting that you need to install ‘Media Player 12.2 Update’ or ‘Repair Windows Errors’, you should ignore these offers and rely on the services you can trust instead. Keep in mind that the application works with third parties who can have different goals and intentions. Nonetheless, because the program is associated to these parties, you should remove it from the computer right away. We have a few PortalMore removal tips you could use. If you lack experience with the manual removal, you can delete PortalMore using automatic malware removal software. In fact, this is the option we suggest to experienced users as well. The manual PortalMore removal may be complicated because some files may be left behind. What is more, certain additionally installed threats may be complex, and their removal might be difficult. Open the Start menu and then move to Control Panel. Now double-click Add or Remove Programs to find the installed adware. Locate the undesirable program, click it and choose Remove. Open the Start/Windows menu from the Task Bar and select Control Panel. Now select Uninstall a program and right-click the undesirable application. Select Uninstall to delete adware from the operating system. Right-click on the Metro UI menu screen and in the new app click All apps. Open the Control Panel for more options and select Uninstall a program. Find the undesirable application, right-click and select Uninstall to delete it. Quick & tested solution for PortalMore removal.